I was actually more drawn to the beautiful murals than the show itself, I am not too sure that is a good thing. So, to me, the pieces that carried some of this work seemed the most interesting. 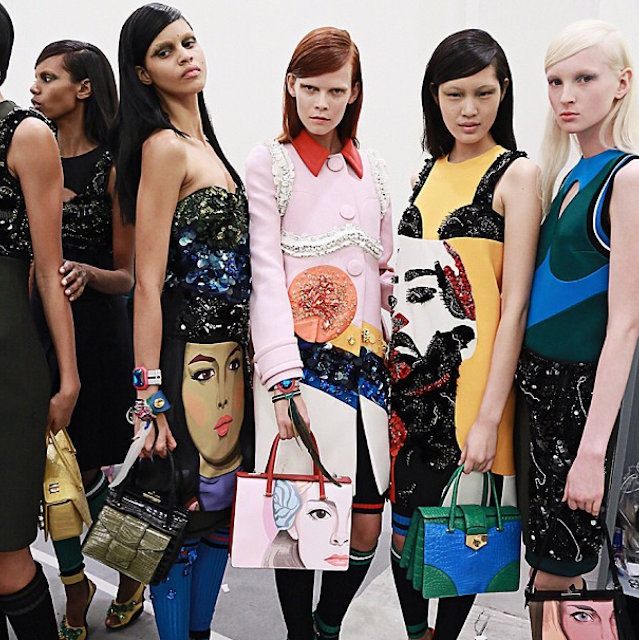 As for the rest, very beautiful and commercial, very Prada with the embellishments and the sporty elements; I can already picture dozens of those pieces and accessories everywhere in the months to come. However, this was not one of those knock-your-socks-off Prada game changers. Sure, no one does it quite like Miuccia, still, the sporty colorblock heel has been done before: of the top of my head I can remember a Ghesquière collection for Balenciaga (I think it was fall 2007) and the embellished rubber flats remind me of the ones Christopher Kane did for SS2012. Hasn't Simons done some face plastering already? Don't get me wrong it's a great collection, I just thought taking cues from the others was more of a Proenza thing.